Dr. Khalaf Ahmad Al Habtoor is a prominent and highly respected citizen of the United Arab Emirates. A self-made man, he is Chairman of the Al Habtoor Group – one of the most successful conglomerates in the entire Middle – East. He is known not only for his many business achievements but also his extensive knowledge of international political affairs his philanthropic activities. He is also Chairman of Dubai National Insurance and Reinsurance Company. of the American United Services Organisation (USO). • Recipient of 'The Officer's Cross of the Order of Merit of Hungary'. Arab world and the West. • UAE Red Crescent Shield of Honour in recognition for humanitarian contributions. • The 'HH Shaikh Isa Bin Ali Al-Khalifa Award for Volunteer Work' in Bahrain. 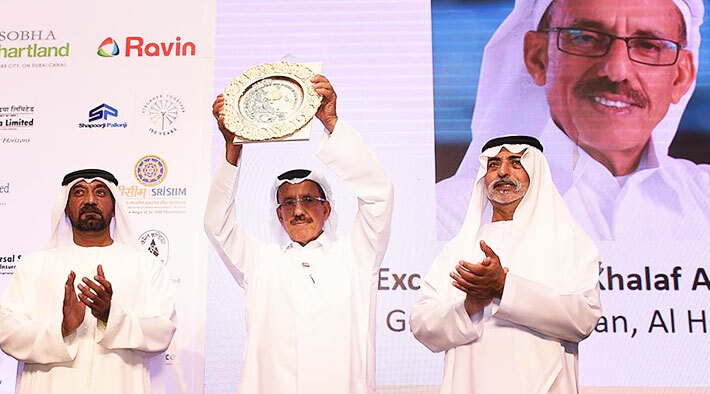 recognition of Al Habtoor's commitment to Indian UAE trade. • The Shield of Merit Award from The United Nations. and E commerce at the World High Tech Forum in London. • Al Habtoor is a great asset to the UAE as one of its greatest sons and a global personality.